Normally, we are asked to provide group activities that are highly relevant to a business meeting or conference – activities with an underlying business message or meaning that participants will uncover. 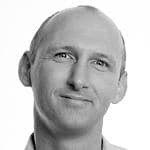 Then again, sometimes, it’s just about trying something totally random and new, just like the series of morning conference energisers we delivered in Harrogate this week! Each morning, we had 200 delegates arrive sporting their Wellington boots. They had all been pre-warned to bring these as we would be going outside for a surprise physical activity. During the (fake) safety briefing about the 90 foot-high zip wire, while the snow was falling furiously, we could see the shock on the faces of delegates that we were actually going to take them all out into sub-zero temperatures! Just at the last minute, as everyone was heading towards the door, there was a reprieve! We stopped them leaving the room to explain that, due to the snow, the zip wire was unsafe to use and that an alternative activity had to be sought. Exactly on cue, our African gumboot dancers entered the conference room, singing and drumming. Shock, surprise and utter bewilderment quickly turned into laughter and total relief. Of course, there never was a zip wire outside but that was the perfect rouse to have everyone bring their own footwear to take part in this high-energy and unique session. 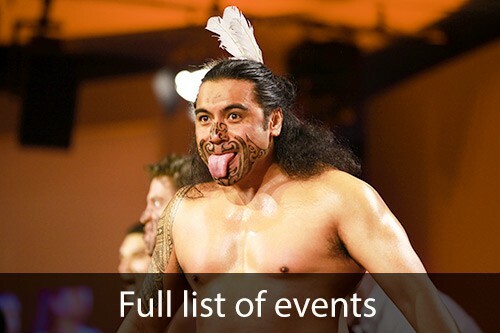 Gumboot dancing provides a fantastic meeting or conference ice breaker, energiser or finale. We also offer it within evening dinners for surprise interactive entertainment. This stunning form of entertainment was created in South Africa by the working miners who discovered that the sounds of a heavy boot on the ground and the different rubber slapping tones give you an instant instrument! 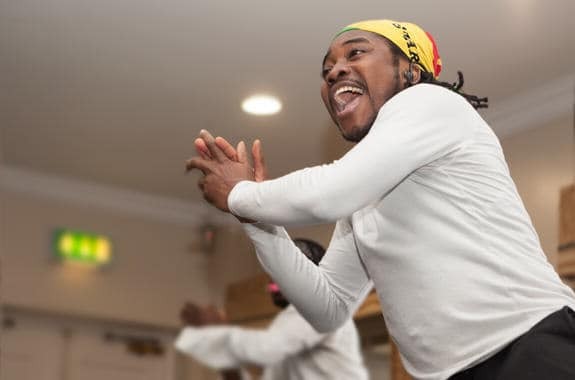 It’s hard to put into words the fun, positivity and cultural expertise that our African group bring to our gumboot dancing events but, in seconds, all the delegates were under their spell. Within 40 minutes, everyone had learned a whole gumboot dancing routine. They were clapping, slapping and stomping together as well as singing the traditional African accompaniment. Towards the end of the workshop, a light-hearted competition ensued to discover the best dancers in the room! The infectious tribal rhythms from the expert Djembe drum player combined with the exuberant antics of our on-stage performers inspired the entire room in one last finale performance. As the delegates cheered themselves and their new African guests, my eyes wandered outside to the falling winter wonderland and I laughed to myself. 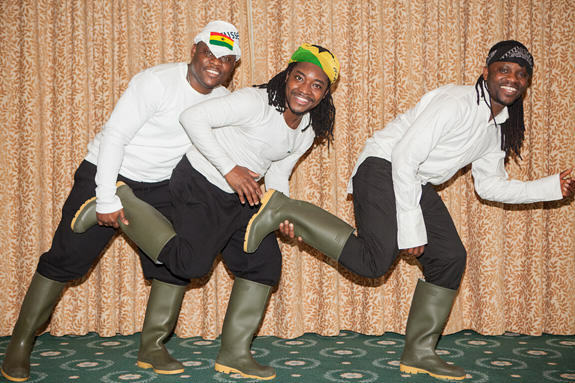 African gumboot dancing in a Yorkshire conference in the snow was just perfect!